en remarques, la climatisation qui fonctionne mal, voire pas, la sono et le dvd sans télécommande. Lugrage store for clients in Trastevere should be free of any charge. Shower cabinet not high enough. Overall great experience. The apartment stands on two levels. On the first, you will find the master bedroom with a king size bed, night tables, and night lamps. You will also have access to an air conditioning unit and a 32″ flat screen TV. 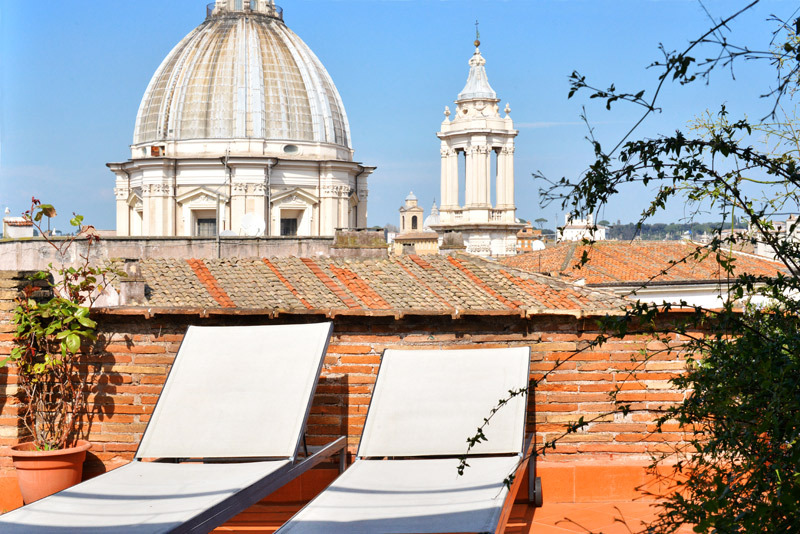 The master bedroom has its own small, terrace with an amazing view over the Sant’Agnese in Agone church. A beautiful wooden staircase leads you to the second level. 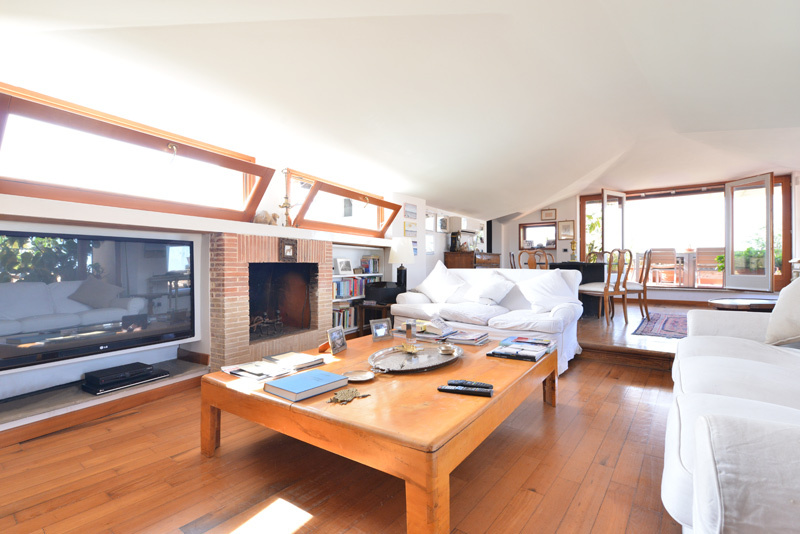 Here you can enjoy the spacious, bright and stylish open concept living room with very elegant parquet floors. 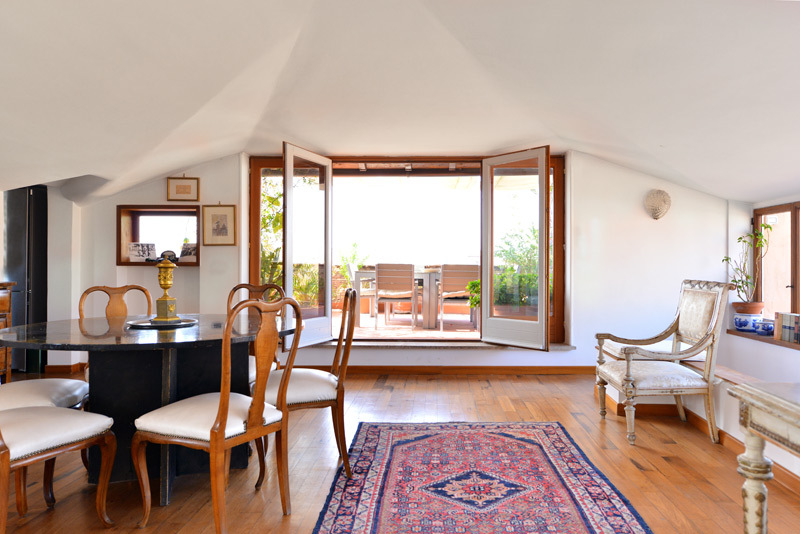 This space is ideal to receive guests during your Roman stay. The white sofas offer lots of sitting space for your guests to lounge comfortably. One of the sofas also opens out into a double sofa bed. A nice wooden coffee table, a decorative fireplace, and a round dining table with 6 chairs, complete this room’s decor. You’ll also find all the comforts you need to make your stay a pleasant one: air conditioning, wireless Internet access, 50″ flat screen TV, and a Hi-Fi system (great for your iPod). 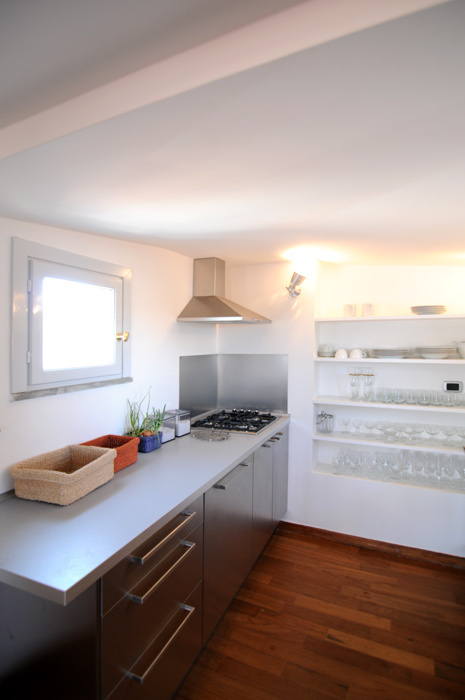 Next to the living room, there is a fully equipped kitchen, with a gas stove, a fridge, a freezer, a dishwasher, and a washing machine. Right by the kitchen, the elegant bathroom comes complete with a shower. 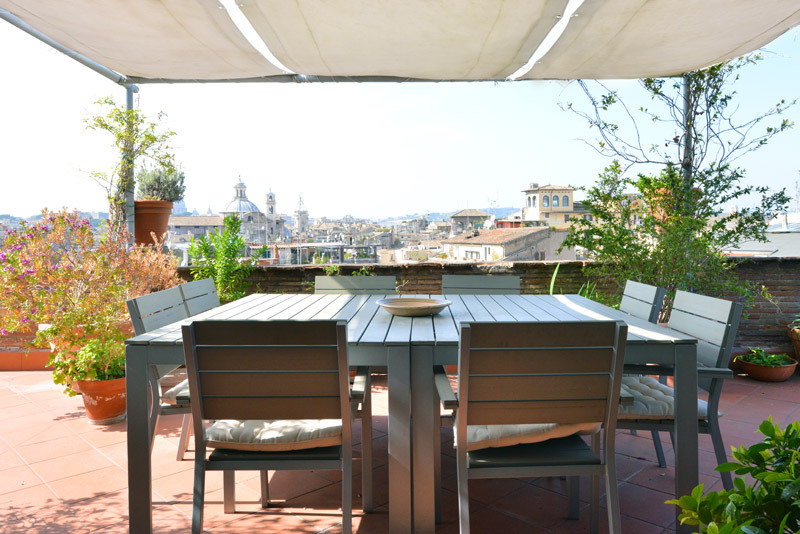 The most exciting feature of this marvellous apartment is its terrace with breathtaking views over the entire city: from here, you can marvel at the sight of the Saint Peter cupola, the church of Sant’Agnese in Agone, the church of Sant’Andrea della Valle, the tower of La Sapienza, the Pantheon, to name a few. 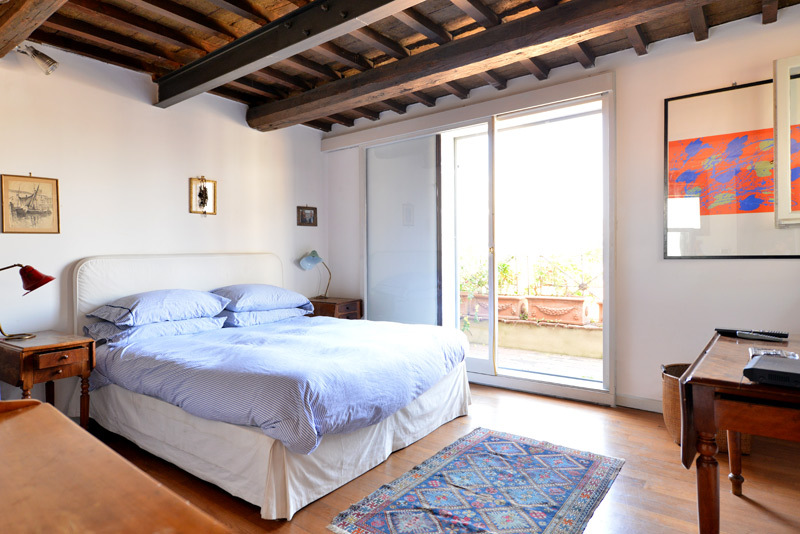 This apartment is a dream and will surely make your Roman holiday nothing short of magical. 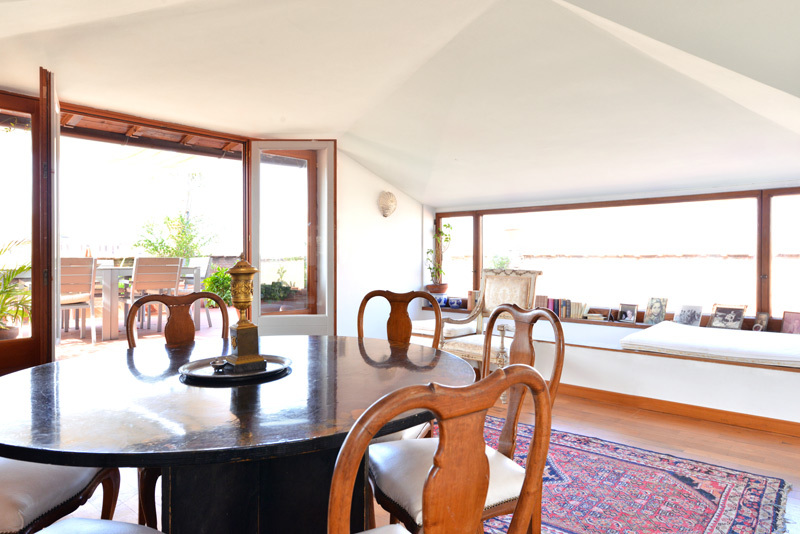 It’s the perfect accommodation for a luxurious and a special stay in Rome, for either a couple or a small family. 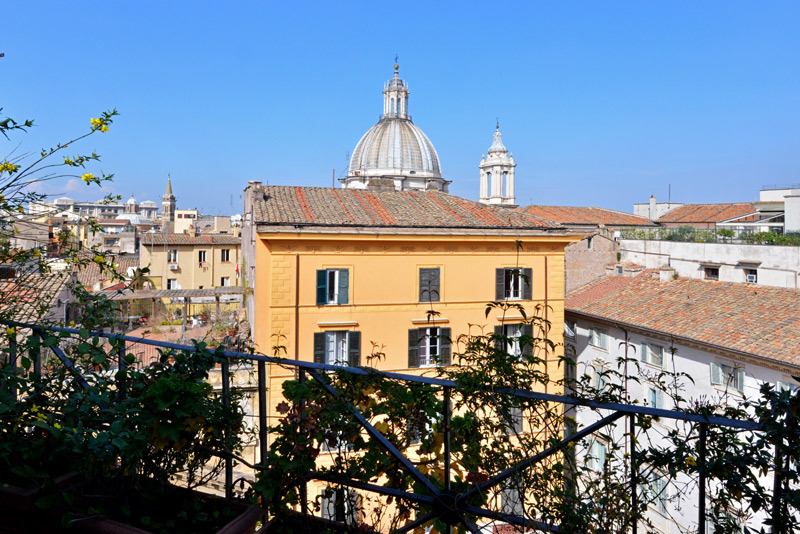 This apartment sits on a small, quiet street which is just 50 meters from Piazza Navona and 100 meters from Campo de Fiori. It is difficult to imagine a better position! The centrality of the apartment is unbeatable. Within easy walking distance you will find attractions such as the Pantheon, Castel Sant’Angelo, and Trevi Fountain, to name but a few. We would recommend taking a stroll towards the Trevi Fountain at night. Once dark, the fountain is magically illuminated, creating an ethereal glow around the piazza. Moreover, in the surrounding area you will find many facilities such as banks, supermarkets, pharmacies and post offices. In the evenings, this area is very lively and a great place to spend the last hours of the day. Here you can eat some authentic Roman cuisine at one of the charming restaurants. Alternatively, you can take your time and enjoy an aperitivo at one of the characteristic bars. In addition to this, a short walk will take you into the Spanish Steps area. Here you will find some of the best shopping opportunities in Rome, with shops of all of Italy and the world’s finest designers. After reading small problems with the apt like shower cubicle too small, bad water pressure, low ceilings this apts good features definitely outweighed it's bad. Great location, helpful staff, comfy bed and lounge and awesome roof top balcony and views. This place was a highlight for us. Showers are taken for 5 mins a day and sometimes the w...Read Moreater was barely running or hot (hopefully something the owner could look at) so this didn't phase is. The low ceiling is into the kitchen and bathroom (which is upstairs from the bedroom I might add). But these little problems were nothing. Our second stay in a Romeloft apartment and it met all our expectations. From meeting Mr Honey on arrival to our departure we were entirely happy and look forward to staying again in one of the Romeloft apartments. 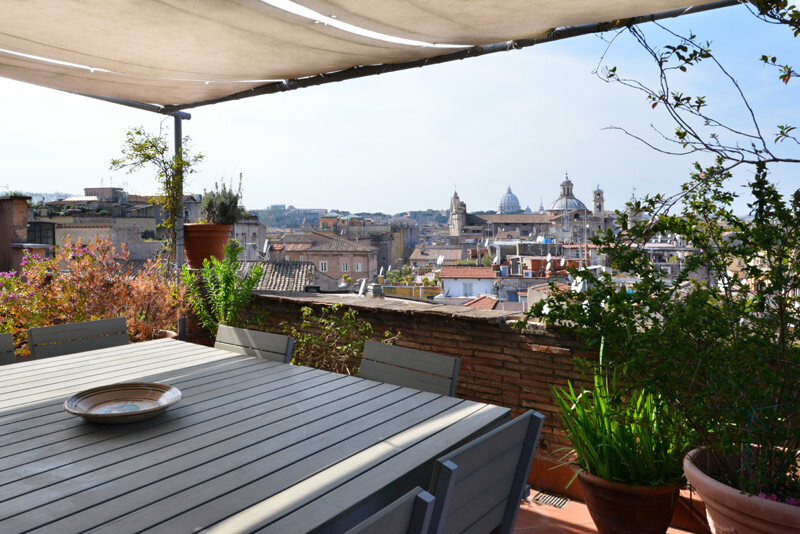 Each apartment has been special in its own way and the nicest thing is to share someone's home, so that you indeed feel at home...Read More when you get back from a long day out walking Rome, or visiting further afield. The Honeys do a very good job indeed. Our family loved this apartment! 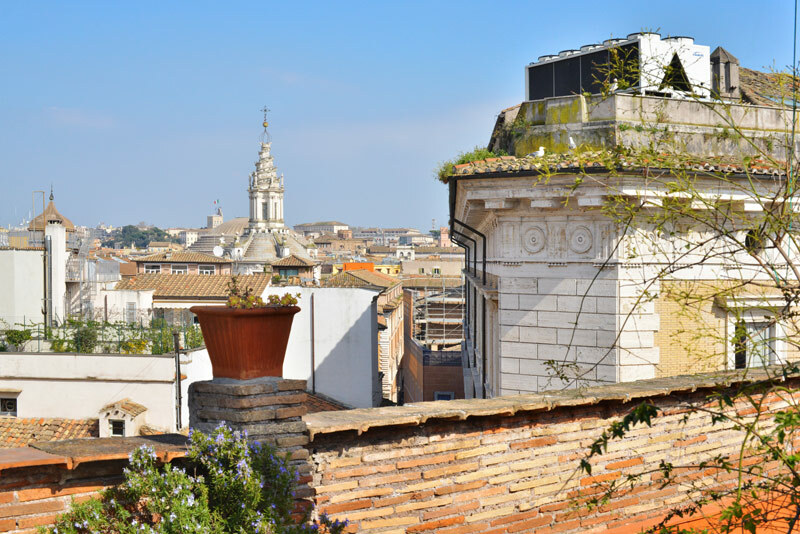 The views were absolutely spectacular and we could see so much of historic Rome from our terrace! In the evenings we had our dinner on the terrace and just enjoyed the views. The sunset near St. Peter's was beautiful. The location is fantastic and we walked to everything. Piazza Navona is literally just do...Read Morewn the street and the Pantheon is just a few blocks beyond it. The area has great restaurants, gelato shops, and a grocery store down the street. We were sad to leave and hope to return to this apartment again. RomeLoft was always very responsive to our questions and they arranged for cars both upon arrival and departure. I wouldn't hesitate to recommend this apartment to my family and friends! Nice terrace with a fantastic view (including St Peters). Loved the layout of the common area (windows allow site of the skyline view even while sitting on the sofa). AC worked well. Sleeping situation was a bit tight for 4 - but worked OK. Arranged transportation from & to airport was prompt. E-mail communication w/ manager was excellent....Read More Overall a very good experience. 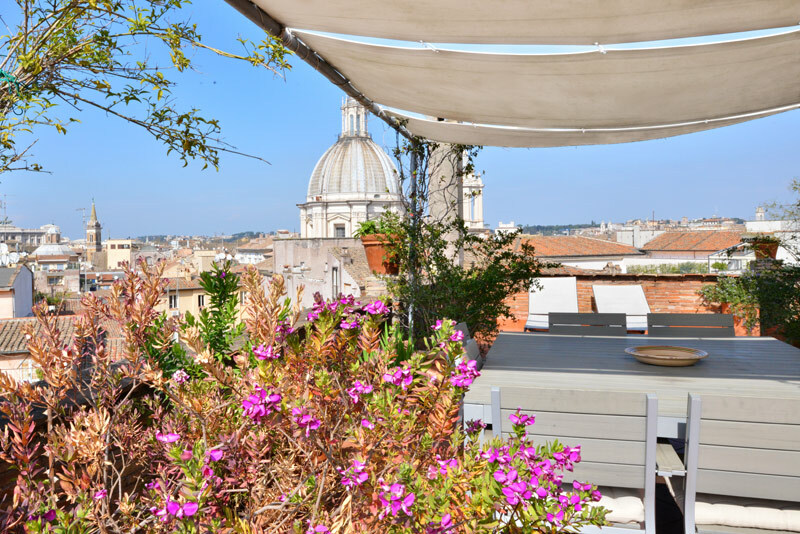 This apartment is eye-popping, primarily for the terrace, which is huge and has a panoramic view of a wide swath of Rome, including St. Peter's basilica, the Corte di Cassazione, Sant'Agnese di Agone, and even the Pantheon dome if you look carefully enough. The terrace is THE reason to consider this otherwise-lovely apartment, because it...Read More's where you will spend as much time as weather permits. 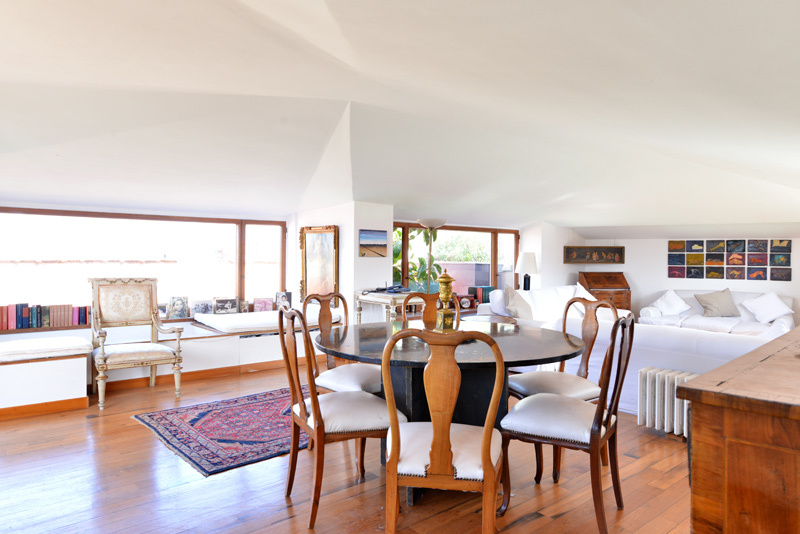 It has a large square table that seats up to eight people comfortably and two chaise lounges. The table area is covered by an awning that makes it usable even in broad daylight. And the view across to St. Peter's coincides with the direction of the sunset, so the sunsets are often spectacular. Terrace aside, the apartment is roomy--very roomy for two, with a bedroom and very large livingroom/dining area. The kitchen is not huge, but it's functional (although there is neither an oven nor a microwave, so all cooking is stovetop). 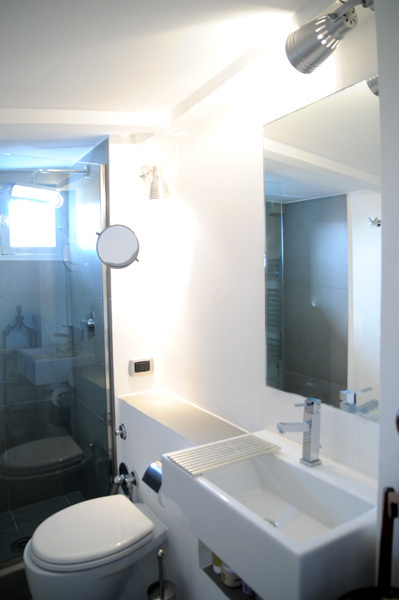 The bathroom is a bit cramped--especially the shower, which has no shelf for soaps and is not fully enclosed, so it's challenging to avoid getting the floor wet. 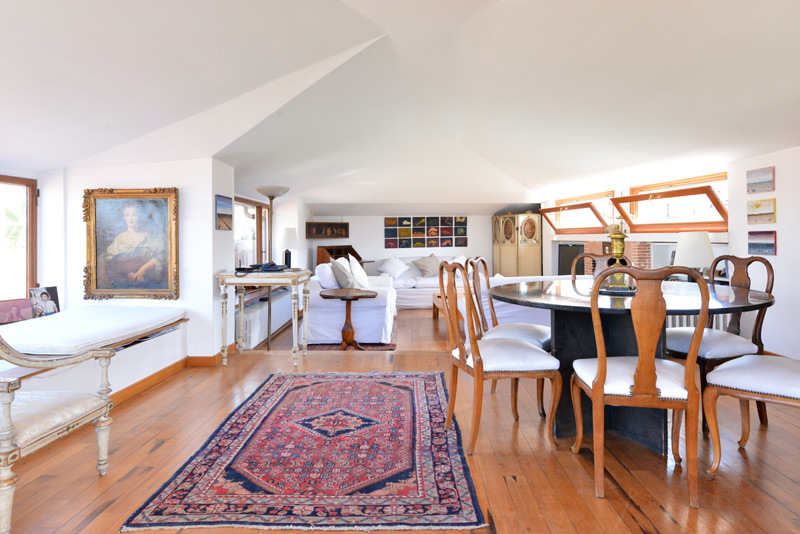 The only other drawback is that the bedroom is on the entry level, and everything else--terrace, livingroom, dining area, kitchen, and bathroom--is up a small flight of stairs. This was no problem most of the time, but it was a bit unpleasant climbing stairs to use the bathroom in the middle of the night. The furnishings are lovely and functional. The apartment is filled with windows that open, and there is good A/C, in both the bedroom and upstairs, for when it's too hot outside for fresh air. The kitchen has a dishwasher, and there is a washing machine on the terrace. There are TVs in both the livingroom and bedroom. There is also WiFi, but it was often slow. 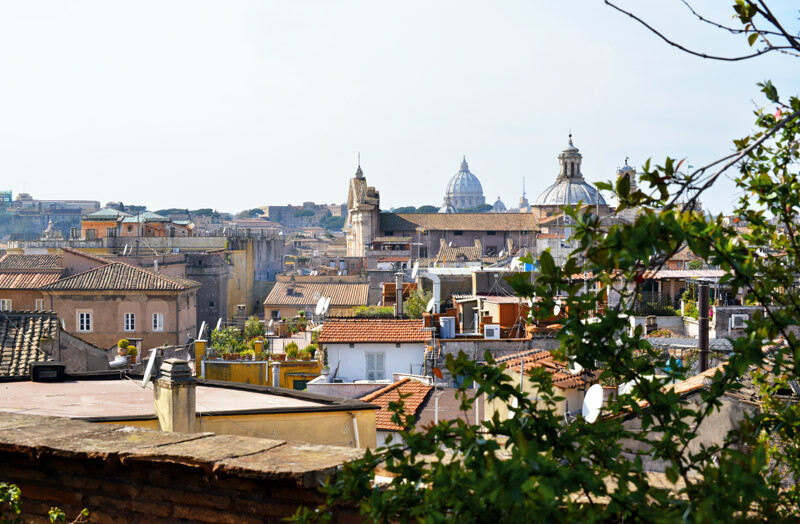 The neighborhood is lively, with lots of shops, restaurants, and a grocery store in short walking distance, as well as Piazza Navona. There's even a taxi stand a few steps away, so it's easy to get to other parts of the city. The folks at RomeLoft were terrific--every need was satisfied, every question answered, every email answered, throughout the duration of our 26-day stay. 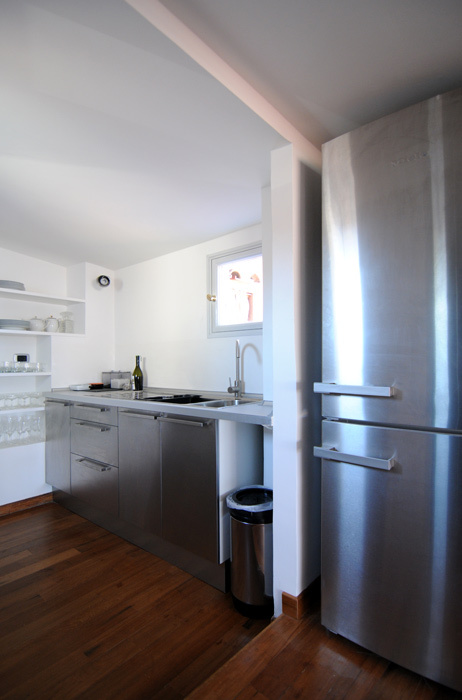 Excelente apartamento en el corazón de Roma, a pocos metros de Piazza Navona. La terraza es impresionante con las vistas de Roma. Ideal para después de recorrer la ciudad durante todo el día y llegar cansado, descansar el las hamacas de la terraza gigante después de una ducha reconfortante y cenar con esas vistas merece la pena. Simplemente esp...Read Moreectacular!!. Solamente creó que en la cocina le faltan algunos electrodomésticos como horno y microondas. I have rented this apartment twice. Lovely apartment with beautiful terrace. Great for parents with children, 2 women traveling or single person. Love relaxing on the terrace. Mr. Honey has been there to great me both times. One night my lights went out and he was at my door within 10 minutes to solve the problem. Campo De Fiori is right down...Read More the street. Every day there is the market selling fresh fruits, vegetables, and about anything else you might want. Restaurants and bars line the piazza. Short walk to Piazza Nonona and all of the sights. Love staying here instead of a hotel. Will rent this one when ever I visit Rome. Our service from Romelofts was first rate beginning even before we arrived. A death in the family required we postpone our trip and they were gracious enough to rebook our apartment for a later date at no additional charge. The driver picking up us from the airport was right on time and a welcome sight after a long day of travel. We did have WiFi c...Read Morehallenges for the first two days but Mr. Honey eventually resolved it. The location is superb, right in the middle of everywhere we wanted to walk, and the Campo di Fiori market every morning for fabulous fruits and vegetables. The apartment it self was a bit of a disappointment and definitely not for two couples, maybe mom/dad and 2 children. The second bed is a pull out queen in the living room. To access the bathroom you must go through the one bedroom and navigate a small set of stairs, not an easy feet in the middle of the night. While the terrace COULD be a highlight the furniture has seen better days and is not very comfortable. I was looking forward to long afternoons on the terrace after a hard day of sightseeing, pasta and wine, but it was not to be. I am sure will be back to Rome and utilize the services of Romelofts, but not this apartment. Une séjour merveilleux à Rome grâce à l'attentive et précise organisation de RomeLoft qui s'avère être sans défaut. Définitivement la meilleure façon de rester à Rome pendant un long séjour. Grand merci à Madame Sibilla et à Monsieur Baccin, toujours là si il y a un problème, sans oublier M. Honey qui fait un travail d...Read More9;accueil ponctuel et diligent. Merci RomeLoft, je reviendrai! sempre! 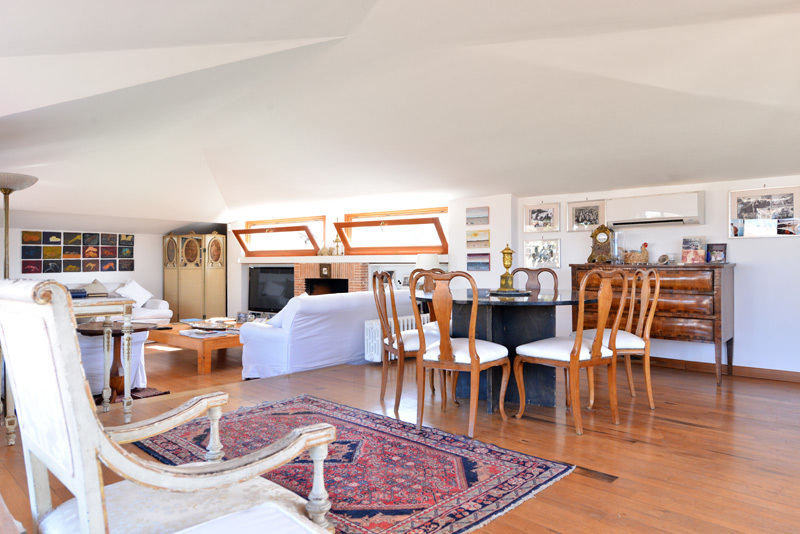 We just spent 3 nights at Camp de Fiori apartment and can't say enough about it! The terrace overlooking the city was so amazing we didnt want to leave. The apartment was in a fantastic location, we had dozens of restaurants within steps. It was beautifully decorated, it made us feel at home. We were traveling with a teen ager, we needed the e...Read Morextra room that a hotel doesnt offer. We ended our day with a glass of wine sitting on the terrace listening to the bells of churches and soaking in the beautiful views. Our service from Rome Lofts was great, we look forward to going back again soon. 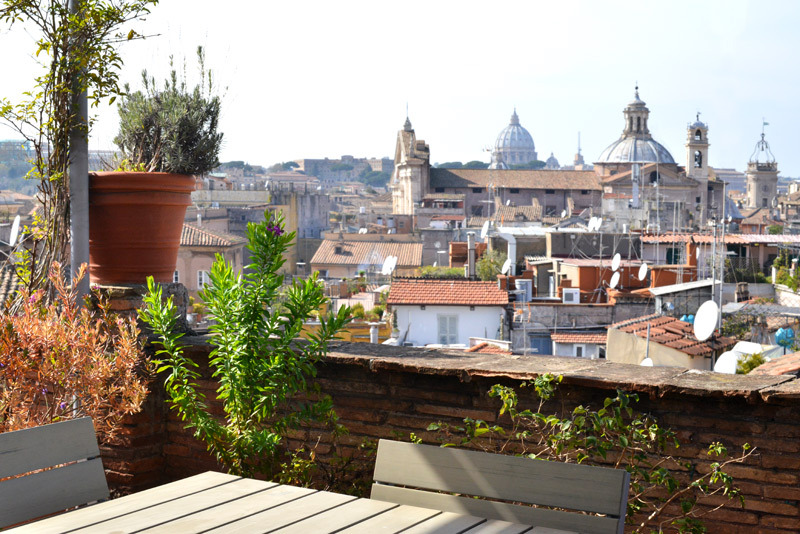 My husband and I have been to Rome multiple times and this apartment was one of the best choices we have ever made. We stayed at this gorgeous Via Dei Leutari paradise in July 2011 with our two children, ages 10 and 12. I can't believe this place is rentable. The view is unbelievable, the kitchen/bath are perfectly outfitted and topnotch, the ...Read Morebeds and linens are comfortable -- we could even charge our ITouch/IPod on the docking station. My only regret is that we spent so little time at the apartment. I was literally choked up to leave and am already planning an opportunity to return with my girlfriends. The RomeLoft process was seamless, efficient, on-time for airport transport, and when we needed help in a pinch, they solved our problems within a couple of hours.